It is no surprise that the dominance of Kenyan runners over the last twenty years has cut both ways in the sport of distance running. While records have fallen with increasing rapidity, the marketability of the sport — and its champions — has also fallen well behind the standard set by the slower champions of the initial running boom. Now, perhaps belatedly, the fastest runners on the planet have begun to acknowledge that their role must extend beyond that of simple performer and include a dash of salesman, too, in the offering of the sport to the public. Of all the Kenyan running champions of recent years perhaps none is more naturally taciturn than former marathon world record holder Patrick Makau. After setting the record, 2:03:38, at the 2011 BMW Berlin Marathon against the former record holder, Haile Gebrselassie of Ethiopia, Makau has been bedeviled by injuries. Then his record fell to countryman Wilson Kipsang this past September, also in Berlin. Makau had hoped to defend his record against Kipsang, but inflammation in his left knee forced him to withdraw from the race. Now that his status — and marketability — as marathon world record holder has been supplanted, his management team at International Athletics Consultancy has stepped forward in an attempt to personalize and better connect their top client to the average runner. The accompanying video is a well-produced result. According to the email that attended the video, “Based on perceived gap between elite athletes and the rest of the field, we have decided to surprise our friends and colleagues at Prague International Marathon and RunCzech and the result of this surprise is the following video filmed during Patrick Makau’s stay in our company’s apartment in Prague in between Patrick’s responsibilities at 2013 Kosice Peace Marathon and his treatment in Munich, Germany at Dr. Hans-Wilhelm Müller-Wohlfahrt’s practice. It is still difficult to decipher Makau’s accented English, so sub-titles might have helped. But the overall tenor of Makau’s delivery, and the quality of the production are a well-considered attempt to address the long-standing public relations gap in the sport. This isn’t the first time Makau has made such an outreach. 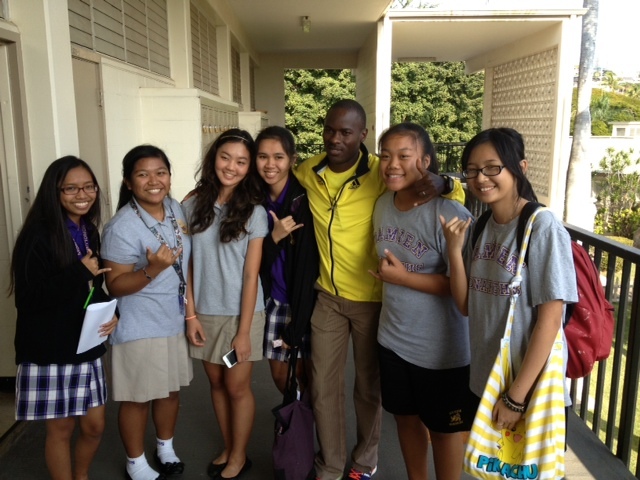 Last March he came to Honolulu for The Hapalua, Hawaii’s Half Marathon where he visited a local school, and competed in The Chase, a competition pitting Kenyan stars against top local runners. Patrick has also been featured in a short anti-malaria public service video back home in Kenya. The current video was unsolicited, and until this weekend Prague International Marathon and RunCzech had no knowledge of the surprise Patrick Makau and International Athletics Consultancy had in store for them. Thanks to Zane Branson president; and Davor Savija Manager, Special Projects at IAC for forwarding. Patrick Makua, running 8 times sub 60 minutes for 13.1… That’s Impressive stuff. Nothing like running 13mph for 13 miles to wake you in the morning. Awesome!